Living a more eco-friendly life is a practice you can feel really good about and it can be benefit your health in many ways. Here are 4 easy ways you can lead a more environmentally conscious and healthy life. In the United States, food waste is estimated at between 30-40 percent of the food supply. To avoid tossing spoiled food, create a meal plan each week and stick to buying just those items while grocery shopping. 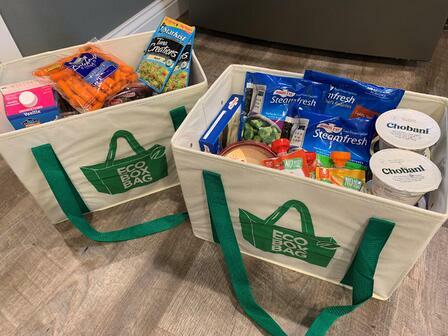 You can use reusable shopping bags to get a better picture of how much food you're buying for your family. These Eco-Totes are sturdy, fold-able, and will fit perfectly in your backseat or trunk. You'll save money and avoid grabbing those high calorie snacks you didn't plan for! For an all natural mold and mildew spray: Mix 1 cup of vinegar, 10 drops of lemon essential oil, and 10 drops of tea tree oil. With a toddler at home, I could use an entire roll of paper towels by bedtime! Paper towels and napkins are made from trees and we all know how important our forests are. Our trees provide oxygen and filter our atmosphere from pollution. 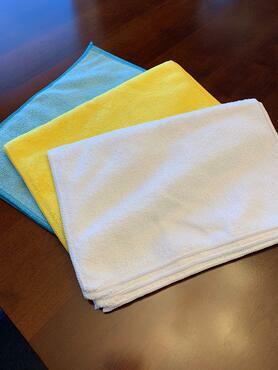 Ditch the paper towels, napkins, and cleaning wipes for some super soft, reusable cleaning cloths. Clean any surface in your home and toss in the wash to use again and again. You'll not only save trees, but money too! Waste less water by turning off the tap while washing your hands and brushing your teeth. Limit soaking in the tub to just a few times a month and keep your showers to 10 minutes or less. While you're waiting for hot water, collect the running water and use it to water your plants, or fill up your water bottle. You can also save a ton of water and money by upgrading your washing machine to an energy-efficient unit. There may even be rebates available through your energy company. It's important to do our part to make the planet a better place for our communities and generations to come. Focus on changing a couple of habits at a time and you'll be saving the planet, calories, and and cash, in no time! Do you have other eco-friendly tips and tricks? Share in the comment section!